« What Could Retaining Walls Add to your Landscape? Start Planning Your Spring Landscaping Project Today! Time to start dreaming up some ideas for your spring landscaping project! Spring is just around the corner! Have you been pining over your neighbor’s beautiful backyard? Dreamed of your very own private oasis of calm in your backyard? Now is the perfect time to start thinking about your landscaping and how it might be enhanced by a spring landscaping project! While you may wish to have a landscape unique among landscapes, all great landscaping projects start out as inspirations from other people. If you see something you like, write it down! A great professional landscaping company will be able to take your dreams and make them into reality. 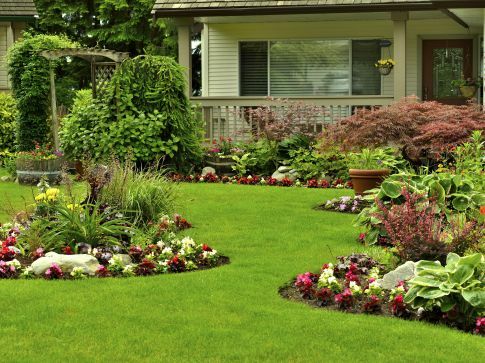 Want to know some great ideas for your dream spring landscaping project? Here are four popular ideas to help you get started. Most people consider their lawn, shrubs, garden, and plants as the most important aspects of their landscaping, but hardly anyone thinks about hardscaping elements. The truth is that hardscape designs such as walkways and patios can offer a lot of depth to your landscape and are essential elements of a well-intentioned landscape design! Consider professional landscape lighting as a part of your spring landscaping project to add a nice touch to your backyard. Low-voltage lighting can play many parts in your overall design. They can highlight the best features of your architecture and vividly enrich your garden beds. In addition, they light up pathways and walkways, making them safer to traverse at night or in slippery conditions. If you’re looking to make your landscape more inviting, consider landscape lighting! Fire pits are a great way to extend the outdoor season for your backyard. They can be enjoyed during the early and late parts of the summer and even late spring/early fall! It provides a cozy area for your friends and family to socialize and enjoy the calming warmth of a fire. Retaining walls are beautiful pieces of landscaping if done properly by a professional team. In addition, they can help protect your home from the effects of soil erosion and groundwater flow. If you’re having these problems, having retaining walls installed would be a great spring landscaping project for your property. This entry was posted on Friday, February 10th, 2017	at 3:37 pm	and is filed under Landscaping Design	. You can follow any responses to this entry through the RSS 2.0	feed. Both comments and pings are currently closed.